We haven’t seen much of the upcoming BMW 4 Series, so we’re sort of in the dark about it at the moment. However, these new photos do reveal a decent amount. For one thing, we can see that the new 4 Series ‘Vert will use a soft-top roof, rather than the folding hard-top of the current car. This is going to be a controversial move but it’s one I think we’re happy about. The controversy will come from both some enthusiasts and most customers, as they will see its soft-top roof as less premium than the hard-top. However, it’s a move we’re happy about as it shows BMW is more dedicated to making its cars drive better than look better. Power folding hard-tops are cool and very impressive to watch work but they add a ton of weight. Convertibles already struggle from a weight increase, due to the increased structural bracing to cope with the loss of a fixed roof. So adding more weight by adding another steel roof with a ton of braces, hinges and electric motors, just exacerbates things. And it’s bad weight, as it’s up high, raising the center of gravity. So enthusiasts typically prefer soft-tops, as they’re much lighter and, honestly, simpler. They typically fold both up and down faster and they’re not as fussy. Plus, they look more elegant, which is why both Rolls Royce and Bentley stick with soft-tops. 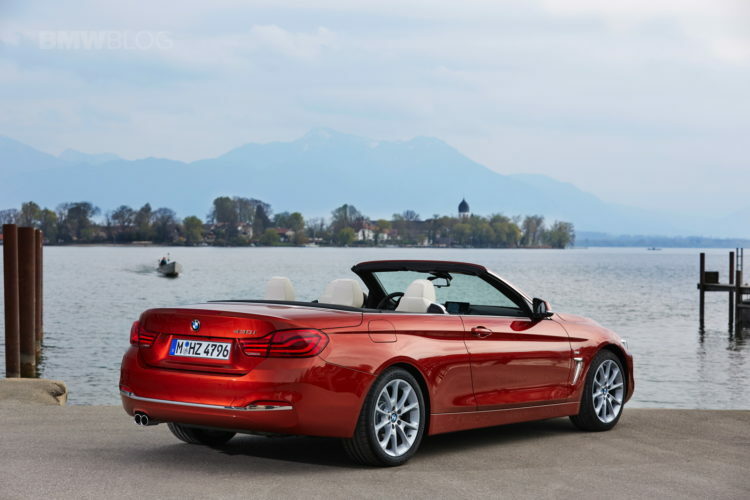 This move to a soft-top proves that BMW is more concerned with its driving dynamics than its perception of luxury or quality and that makes us happy. In these photos, we can also see that the new 4 Series will adopt a bit of the 8 Series’ styling cues, which is not something we’re going to complain about. So it should look very good when it finally debuts. Add those good looks to its reduced weight over its predecessor, and the possibility of BMW giving it the same new dampers and steering as the G20 3 Series, and the BMW 4 Series is shaping up to be a great sports coupe. Or convertible.